The Mammalian Cell – Online Medical Course | Start with Lecturio! Get in Touch with Histology Basics! 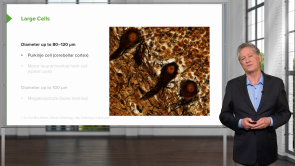 This online course provides medical students with the most important basics in the mammalian cell. Learn more about the cell structures, sizes and functions. Accurate and easy-to-grasp explanations; Well done! Includes the basis for understanding but touches on interesting details as well. Easy to follow and leaves a solid understanding! Amazing and I learned more from his videos then in class. I chosed to give it 4 stars, because I loved the way the lecture was eplained. I am not a native english speaker and therefor prefered the rather slow speed of speach. unfortunatelly there have not been any Control questions and that is why I only rated this lecture with 4 out of 5 stars. I really really liked your explanation. Simple, precise and well-organised. The flow of the video is fairly slow, however, it's pretty detailed and informative.